Almost every organism on earth, from archae to humans, exhibits circadian rhythms – periodic cycles of behavior or gene expression that repeat approximately every 24 hours. These rhythms are generated by a circadian clock – an internal time-keeping mechanism – which can be entrained and synchronized by environmental cues such as temperature or light/dark cycles. This clock may provide organisms with an adaptive advantage throughout their life, and disruption of the function of this clock can lead to severe behavioral and metabolic disorders in humans. For more than two decades researchers have wondered whether the tiny soil-dwelling nematode worm Caenorhabditis elegans, one of the foremost model organisms, contains a circadian clock. Circadian rhythmic behaviors described previously in C. elegans are variable and hard to quantify, and no genes were known to exhibit gene expression oscillations with 24 hr cycles as shown in many other animals. Now, in a recent study published in the open-access journal PLoS Biology, several students and postdoctoral fellows in the labs of Piali Sengupta and Michael Rosbash joined forces and took on the challenge to identify C. elegans genes under clock control. 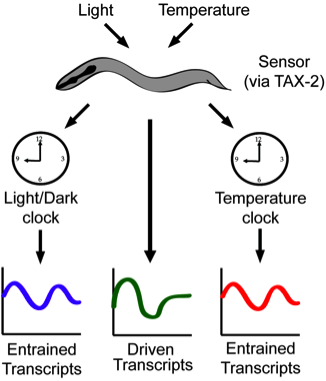 Light and temperature cycles both drive and entrain 24 hr oscillations in gene expression in C. elegans. They showed that indeed C. elegans contains genes whose expression cycles in a circadian manner. They found that light and temperature cycles appear to regulate different sets of genes (see above), indicating that these stimuli may entrain two distinct clocks. Moreover, the underlying clock mechanisms may not be dependent on oscillations of known clock genes. “These findings were surprising to us since Drosophila only has a single conserved clock running in multiple cells and tissues” says Alexander van der Linden – lead author and former postdoctoral fellow in the Sengupta Lab. C. elegans has a wealth of genetic and behavioral tools. The next critical step will be to identify the mechanisms underlying the C. elegans circadian clock(s). These investigations may also provide information of how the clock evolved since nematodes and humans split about 600-1200 million years ago. Alexander M. van der Linden is now an Assistant Professor at the University of Nevada, Reno. The work was conducted in the labs of Profs. Michael Rosbash, a member of the Howard Hughes Medical Institute and Piali Sengupta in the Department of Biology. Other authors who contributed to this work include Molecular and Cell Biology graduate students Matthew Beverly, Joseph Rodriquez and Sara Wasserman (now a postdoctoral fellow at UCLA), and Sebastian Kadener, a former postdoctoral fellow who is now an Assistant Professor at the Silberman Institute of Life Science, The Hebrew University of Jerusalem, Israel. The Sengupta Lab website has been updated with lots of new imagery. Check it out!